Thanksgiving isn’t complete without a turkey periodic table wallpaper. These turkeys have scratched up a few element facts from the fall leaves including atomic number, symbol, name and atomic mass. Just like fall leaves, turkeys change colors with the season. These turkeys change colors to match the element groups of their element. This table includes the names and symbols for elements 113, 115, 117 and 118, so all 118 elements are covered. This wallpaper has a resolution of 1920 × 1080 and suitable for any screen. Click the image or download it directly. 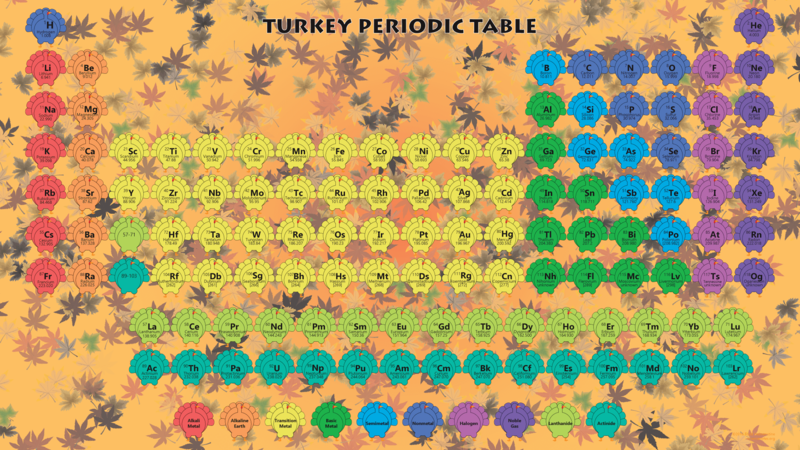 If you would like to make a Turkey Periodic Table poster, there is a PDF version of this Thanksgiving table. All you need is a color printer, a few sheets of paper, scissors and tape. Select “Poster” as your print option, cut off the margins and tape the pieces of together. If you want to avoid all that and fit the table on a single sheet of paper, choose the “Fit” and “Landscape” options for printing.